My Little Prairie Home: A Cool, Limited Space Gardening Option: Grobags! When we were living in England, we thought we were only going to be staying for a year, so we never bought a house there. Unfortunately, most rentals don't take kindly to your tearing up their lawns or landscaping to put in vegetable gardens. So what was this Practical Pioneer to do? I mean, I had just come from the land of long growing seasons and prolific harvests! My summer was spent feasting on fresh, vine ripened produce and my autumns were spent canning and dehydrating and preserving that bounty for all winter and spring. So how was I to handle living on a tiny island (England is less than 1/3 the size of California!) with drizzly, cool summers? I was pretty bummed. But then someone pointed out 'Growbags' in the local garden center. They're basically just bags of growing medium (a big longer and flatter than our bags of potting soil or compost). Depending on the size of the growbag, you either make two or three X shaped slits in the top of the bag and plant veggies right in the bag. Things like cucumbers and zucchini work particularly well, but you can grow most 'above ground' produce from lettuce to peppers. The benefits of growbag gardening is that you can put them anywhere, even on a small balcony. If you place them on a concrete or stone patio, the residual heat in the stone will keep the bags warmer in the night, which the plants love in cooler climes. Plus, once the season is over, the bags can be stacked out of the way in readiness for the next year's season. 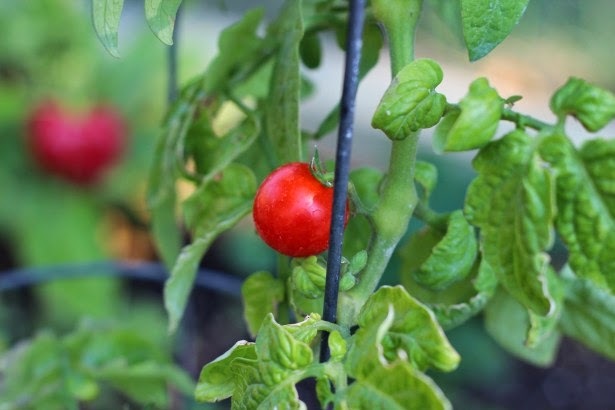 If you have a proper frame, you can even grow things like tomatoes and beans! I'm going to do a bit of a hybrid in my make-shift poly tunnel this year. . .I'll have a simple raised bed, some stuff in large pots, and I'm going to see if using bags of good quality potting soil will work the same as growbags. I have no idea if it will work, but it should be fun trying! If you want to try, too, here are a couple of links for tomato and potato grow bags from Amazon. They have a load more there, too! Hi Robynne, you are right growbags are just the same as a bag of potting compost or growing medium (not sure of the correct American terminology) they are just bigger. An amusing aside to this story is that in the UK we call baby all in one suits 'babygrows' I think you call them onesies, and they often are also knicknamed growbags. I was soooo skeptical when I first used them in the UK, Liz, but I had more courgettes (zucchini all you American folks!) than I could handle and the most lovely cucumbers, as well. Given the resurgence of small scale farming and urban farming here in the US, I's surprised we haven't seen more of these in the US! And I always giggled, being I owned a baby product importing company in the UK, about the babygrow-growbags thing!